It is interesting to learn about the ways that different people crochet. Back in March, Rachel shared a video with adaptive crochet methods for the legally blind. This got me thinking about what the term “legally blind” means and the fact that any of us could possibly become legally blind. Will we still crochet? If it ever happens to me, I would like to! This led to a web search about blind crochet. What I found was fascinating. Yet whether a person is fully sighted, is completely without sight, or lies anywhere in between, he or she can still crochet. But how will that person learn? In truth, it depends upon the person. Some people have learned to crochet before they lose their sight but have to modify their techniques to continue. Others learn to crochet while never having seen yarn or a hook before and do so purely by touch. I found a very informative thread on Crochetville.com that spoke about teaching crochet to a person that is blind. The original poster wanted tips on teaching her sister, who was “almost totally blind” to crochet. One commenter in the thread self-identified as “totally blind” and shared their perspective. They recommended starting with a J (6.0 mm) or K (6.5 mm) hook and described the following method. The following tip could be helpful for any crocheter, but worked well for the commenter. And finally, the commenter shared tips on finding patterns. I guess that is yet another wonderful thing about the internet – it can make information more accessible to everyone. Yet even without using the computer, a blind crocheter can find patterns published in braille. Copper Dots has a list of crochet pattern books in braille for sale. To connect with Blind and Partially Sighted crafters, try this Yahoo group, which is currently still active. Vision Aware shares a useful page with tips about setting up your work space, doing the craft, and finding more information. Finally, I wanted to share two websites with inspiring stories of blind crocheters and beautiful crochet work. The blog Crocheting Blind is blog started by two crocheters who are legally blind. The work is beautiful and they also share tips to help people improve their handiwork! The second is a post on Crochet Concupiscence entitled 15+ Inspiring Blind Crocheters and Visually Impaired People Who Crochet. Both are good reads! So what about you, my friends? Have you ever thought about blind crochet? Are you or do you know anyone who is blind and crochets? What did you think of the resources I shared here? Do you have any resources to share? Please leave your thoughts, ideas and questions in the comment section below. This entry was posted on Tuesday, November 17th, 2015 at 12:00 AM by Caissa "Cami" McClinton	and is filed under Fun Ramblings. You can follow any responses to this entry through the RSS 2.0 feed. You can skip to the end and leave a response. Pinging is currently not allowed. My Mother was blind and did both knit and crochet. She made afghans for church fundraisers. This made her feel like she was contributing to the church. She did know how to do both before she went blind. She was an amazing woman. Both of my grandmothers could crochet. My maternal grandmother did knitting & crocheting and she was the one to teach me when I was 9 years old. She was an amazing decorative painter- as was her daughter, my Mom. My paternal grandmother crocheted more. The whole family has some of her blankets or beautiful tablecloths. she went blind in her 80’s, but my Aunt would buy her yarn and she would continue to crochet!!! I always thought it was amazing!! I have tried to crochet with my eyes closed! I do ok! 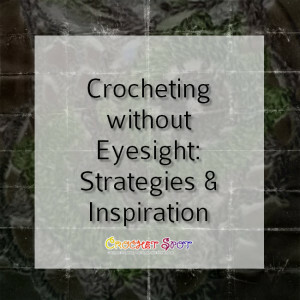 I would like to think that I would continue to crochet if I had limited sight! Oh yes ! My mum was diabetic and she could crochet and knit till the end. I feel once a crocheter always a crocheter …… Cheers to life!